Growing up on the small, tropical “island of the gods”, in central Indonesia. Life in the ocean came naturally to me. For both pleasure and survival. As far back as I can remember I was diving down to our beautiful reefs with no mask or fins and excitedly flying with our local Manta Rays underwater. Magic!! After enjoying school and finishing as a top student, I was keen to begin work. There are not so many opportunities here for work, outside of tourism. So, I quickly got a job in house-keeping at a hotel. After several years in this position, and with a young family to support, I accepted that this would be my life…..
Then, I tried diving!! Thanks to my friends at a local PADI dive centre, they gave me my first Discover Scuba Dive. After this, nothing could be the same. It changed me. I visited every Dive centre on the island, asking for work and training. Blue Corner Dive gave me an opportunity. I am a hard worker so I began as a tank porter and then progressed to become a member of the boat crew. And as a reward for my hard work, I was slowly taught to Scuba dive. The more I learned, the more I loved the ocean. From the smallest shrimps to our seasonal giant visitors, the Mola. My passion grew for all things tiny. I love the challenge of spotting something small and new! Years later, my dreams came true. I became a PADI Divemaster! Thanks to my wise and patient mentor, Phil Voss at Blue Corner Dive. Then, my skills for finding tiny magic creatures, I could share with everyone I too guide. My colleagues suggested many times that I try to become a PADI Instructor, but I feared I was not adequate. And the IDC is a course I could never afford. It took me a long time to find the courage and to see how much faith Blue Corner Dive had in me. I also had the support of my wife and two boys who I knew I would not see for many days – very difficult for me to not be with my family for so many days. After 2 years of working as a Divemaster, it was time. I was ready to join the PADI Instructor Development Course, my family was ready, Blue Corner Dive was ready! 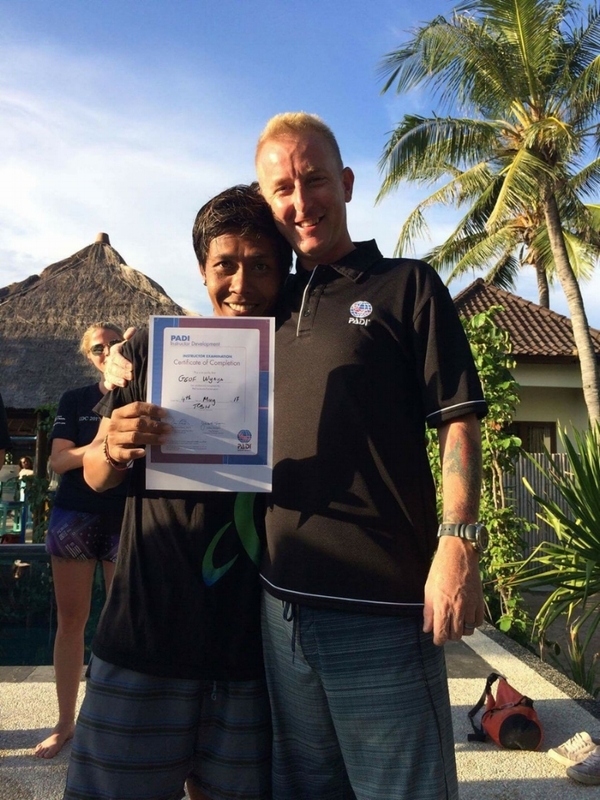 The PADI Scholarship program helped support me in successfully completing the PADI IDC/IE. Everyday during the IDC, I woke up wondering “how can I learn anymore? Surely my head is full! !” Thanks to the patience of my Course Director Cody McDonald, Master Instructor Rosie Dixon, and IDC Staff Instructor Made Partayasa, I managed to learn and understand a little more each day. And have lots of laughs along the way. Cody and the Team at Blue Corner Dive promised me a ‘Stress Free IDC’ and you know what? It was! Every day on a beautiful beach, surrounded by happy, wise people made it just perfect. And gave me friends for life. The hard work that I did everyday prepared me for the Instructor Exam. I cannot express my gratitude enough to the amazing, supportive and fun IDC training team, Cody and Rosie and to all the other candidates in my group. The IDC Team found my learning style and helped me understand everything I needed to be successful. Thanks also to all my colleagues at Blue Corner Dive for the laughs and PADI for supporting my dreams and changing my life. Now I transform the lives of others with the magic of dive training. Nothing could be better. And to get to where I am today I have climbed a mountain….. an amazing story to tell, and many thanks to the PADI Scholarship Program and all who supported my journey!